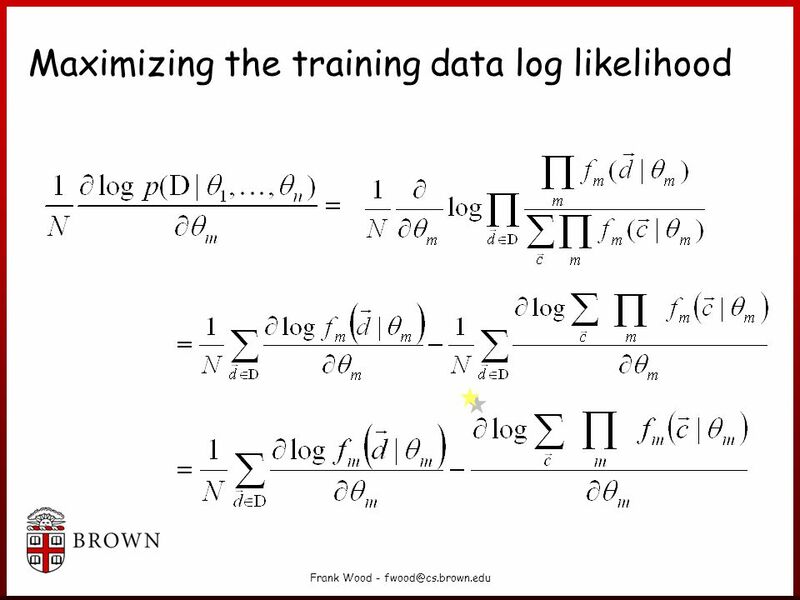 Frank Wood - Training Products of Experts by Minimizing Contrastive Divergence Geoffrey E. Hinton presented by Frank Wood. 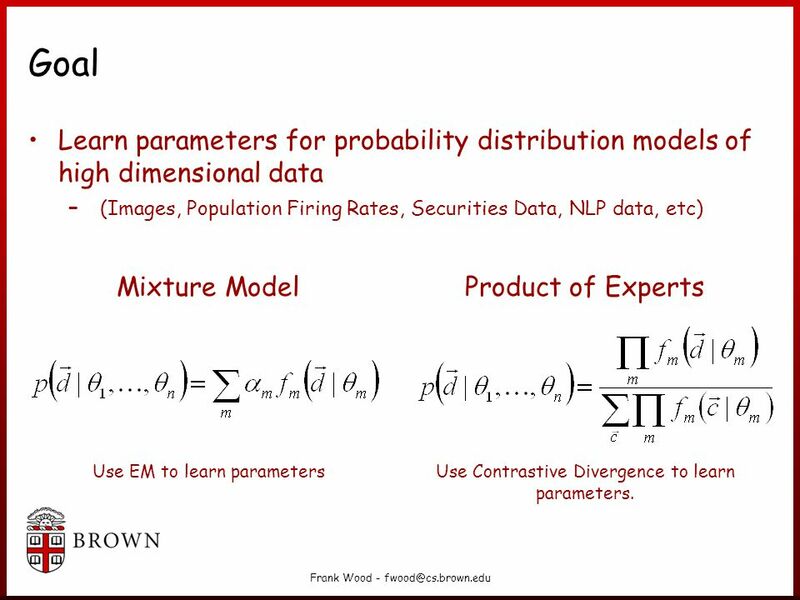 2 Frank Wood - fwood@cs.brown.edu Goal Learn parameters for probability distribution models of high dimensional data – (Images, Population Firing Rates, Securities Data, NLP data, etc) Mixture Model Use EM to learn parameters Product of Experts Use Contrastive Divergence to learn parameters. 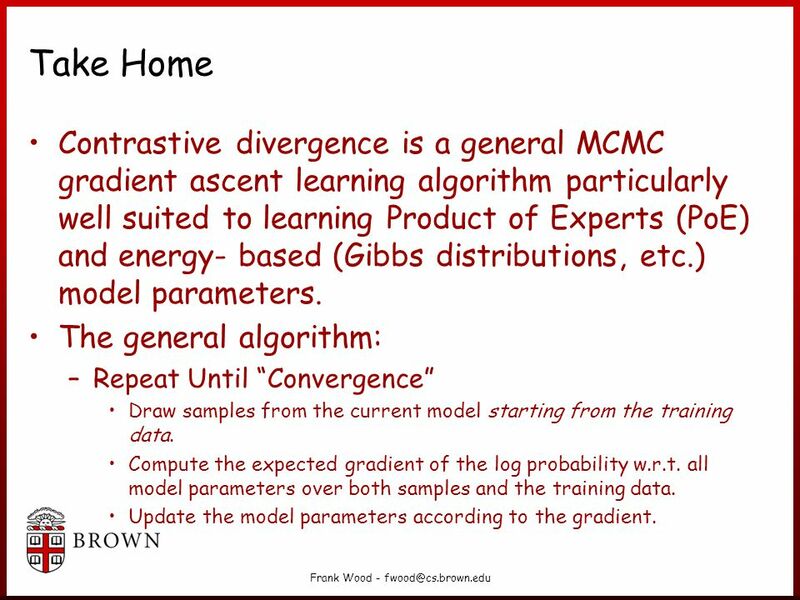 3 Frank Wood - fwood@cs.brown.edu Take Home Contrastive divergence is a general MCMC gradient ascent learning algorithm particularly well suited to learning Product of Experts (PoE) and energy- based (Gibbs distributions, etc.) model parameters. The general algorithm: –Repeat Until “Convergence” Draw samples from the current model starting from the training data. 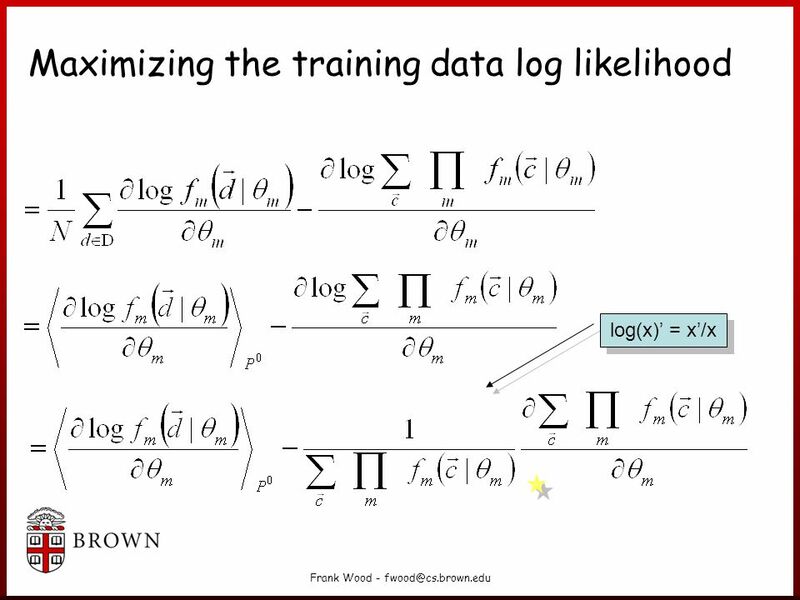 Compute the expected gradient of the log probability w.r.t. all model parameters over both samples and the training data. Update the model parameters according to the gradient. 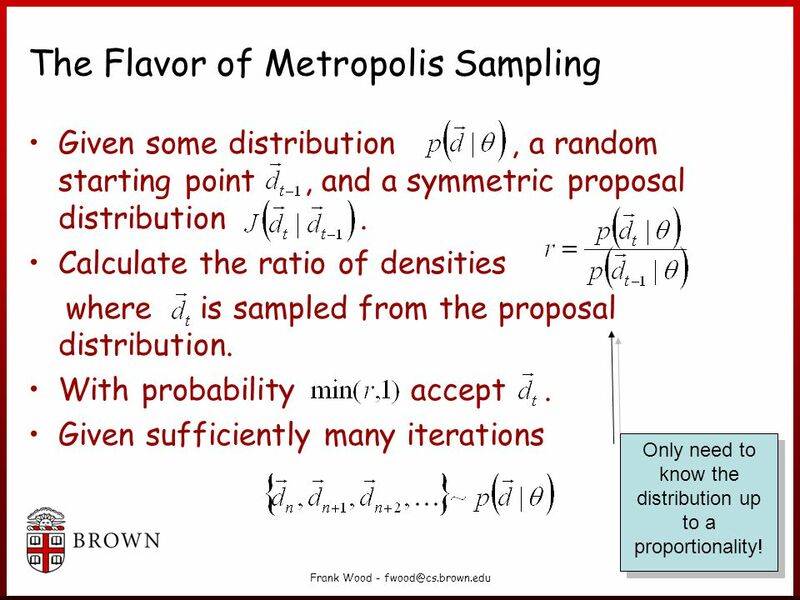 5 Frank Wood - fwood@cs.brown.edu The Flavor of Metropolis Sampling Given some distribution, a random starting point, and a symmetric proposal distribution. Calculate the ratio of densities where is sampled from the proposal distribution. With probability accept. Given sufficiently many iterations Only need to know the distribution up to a proportionality! 6 Frank Wood - fwood@cs.brown.edu Contrastive Divergence (Final Result!) Law of Large Numbers, compute expectations using samples. Now you know how to do it, let’s see why this works! Model parameters. Training data (empirical distribution). Samples from model. 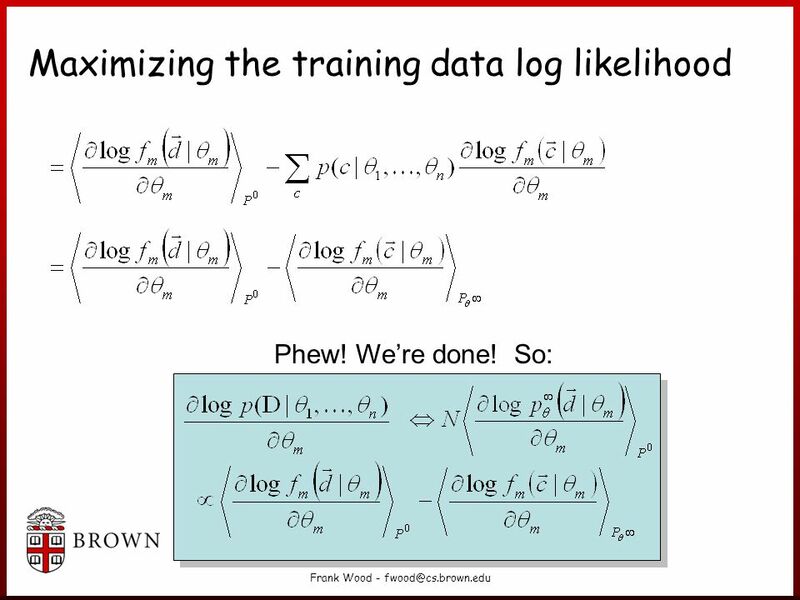 8 Frank Wood - fwood@cs.brown.edu Maximizing the training data log likelihood We want maximizing parameters Differentiate w.r.t. to all parameters and perform gradient ascent to find optimal parameters. The derivation is somewhat nasty. Assuming d’s drawn independently from p() Standard PoE form Over all training data. 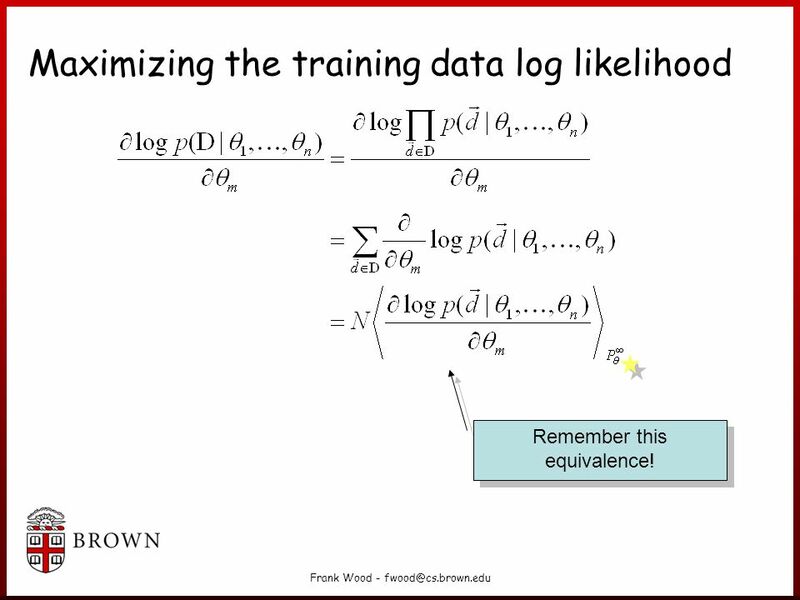 9 Frank Wood - fwood@cs.brown.edu Maximizing the training data log likelihood Remember this equivalence! 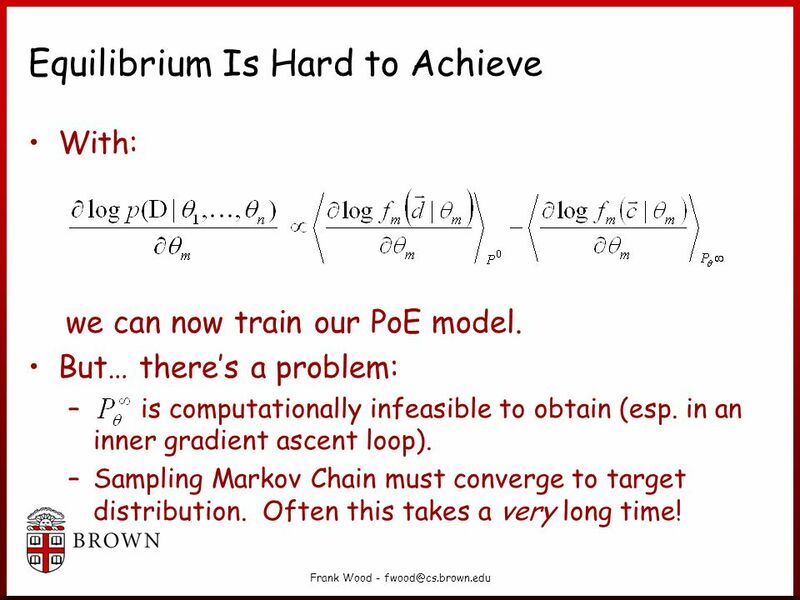 15 Frank Wood - fwood@cs.brown.edu Equilibrium Is Hard to Achieve With: we can now train our PoE model. But… there’s a problem: – is computationally infeasible to obtain (esp. in an inner gradient ascent loop). –Sampling Markov Chain must converge to target distribution. Often this takes a very long time! 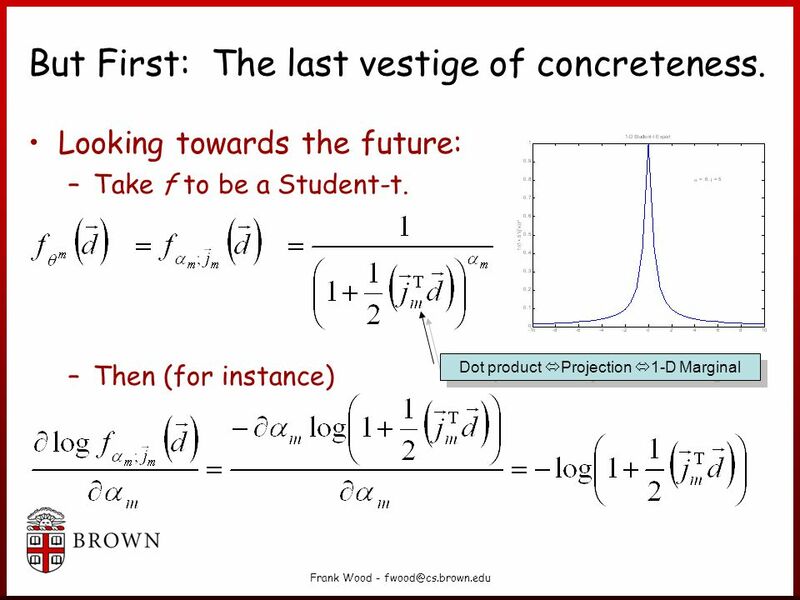 16 Frank Wood - fwood@cs.brown.edu Solution: Contrastive Divergence! 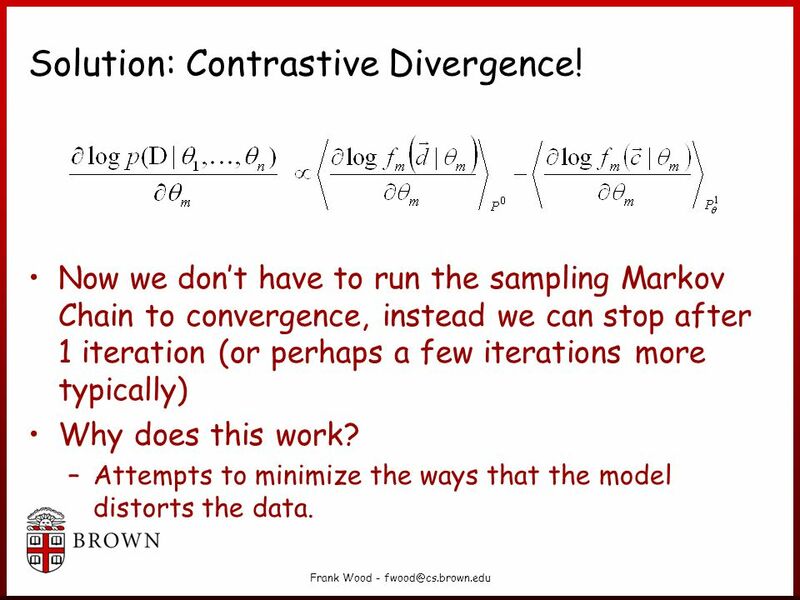 Now we don’t have to run the sampling Markov Chain to convergence, instead we can stop after 1 iteration (or perhaps a few iterations more typically) Why does this work? –Attempts to minimize the ways that the model distorts the data. 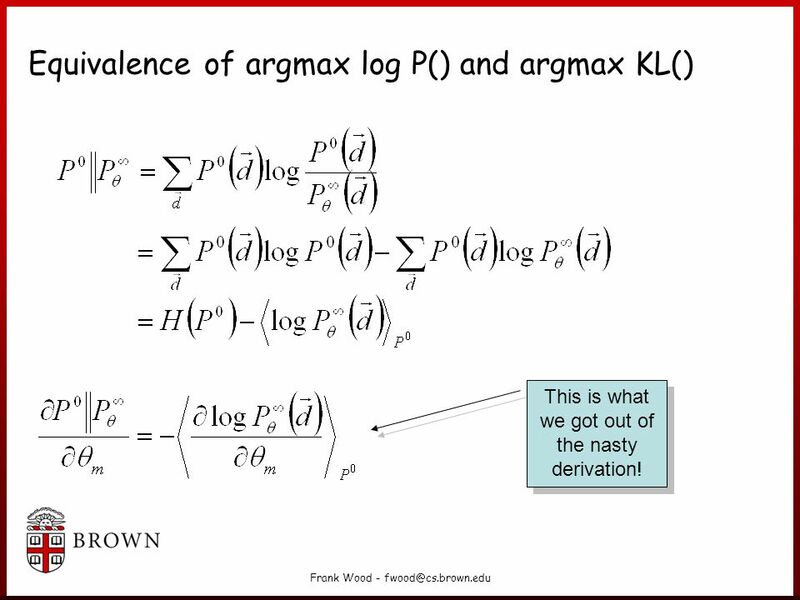 17 Frank Wood - fwood@cs.brown.edu Equivalence of argmax log P() and argmax KL() This is what we got out of the nasty derivation! 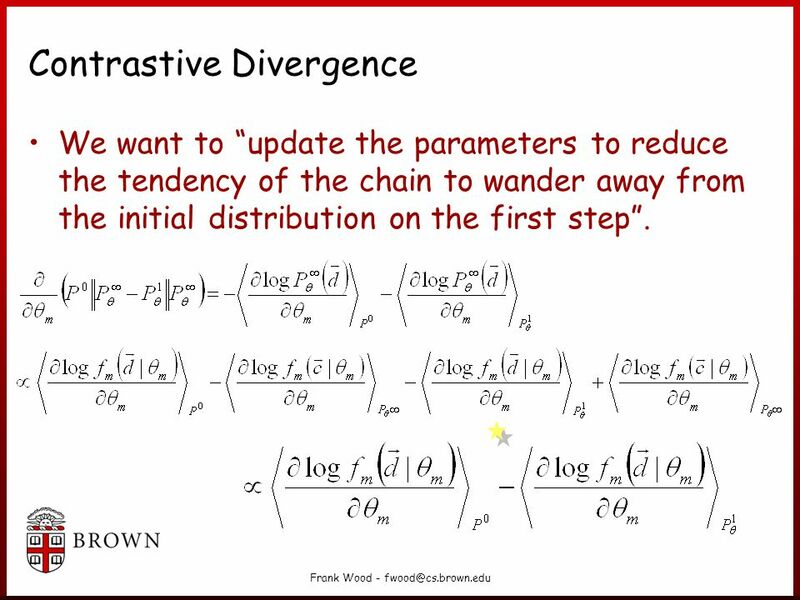 18 Frank Wood - fwood@cs.brown.edu Contrastive Divergence We want to “update the parameters to reduce the tendency of the chain to wander away from the initial distribution on the first step”. 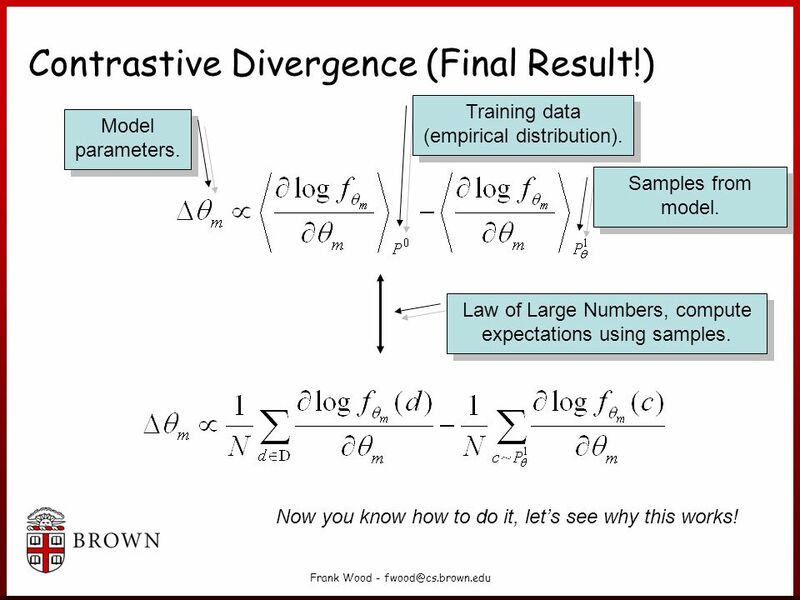 19 Frank Wood - fwood@cs.brown.edu Contrastive Divergence (Final Result!) Law of Large Numbers, compute expectations using samples. Now you know how to do it and why it works! Model parameters. Training data (empirical distribution). Samples from model. 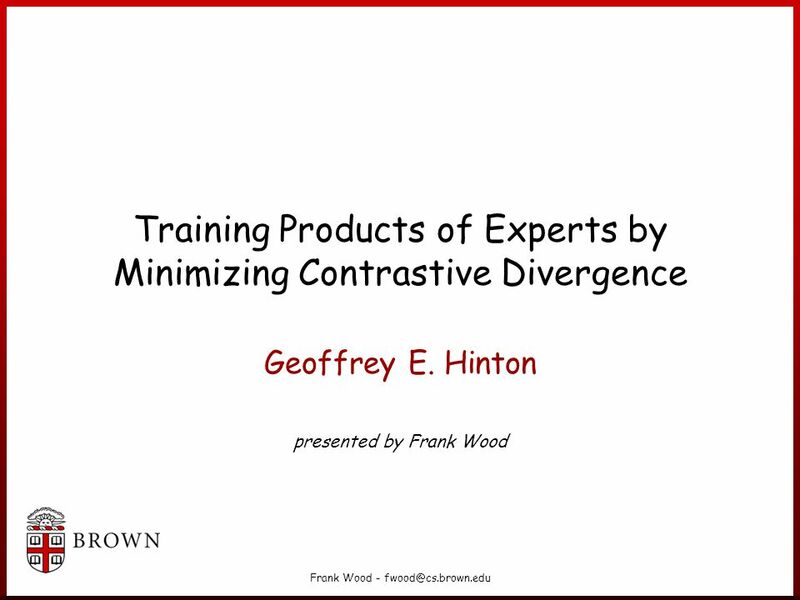 Download ppt "Frank Wood - Training Products of Experts by Minimizing Contrastive Divergence Geoffrey E. Hinton presented by Frank Wood." University of Joensuu Dept. of Computer Science P.O. Box 111 FIN Joensuu Tel fax Gaussian Mixture. Deep Learning Bing-Chen Tsai 1/21. 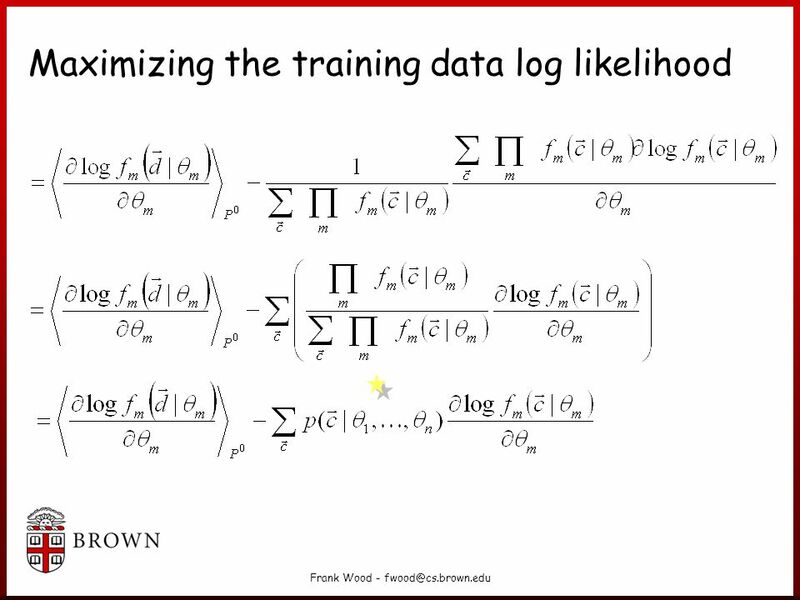 Unsupervised Learning Clustering K-Means. 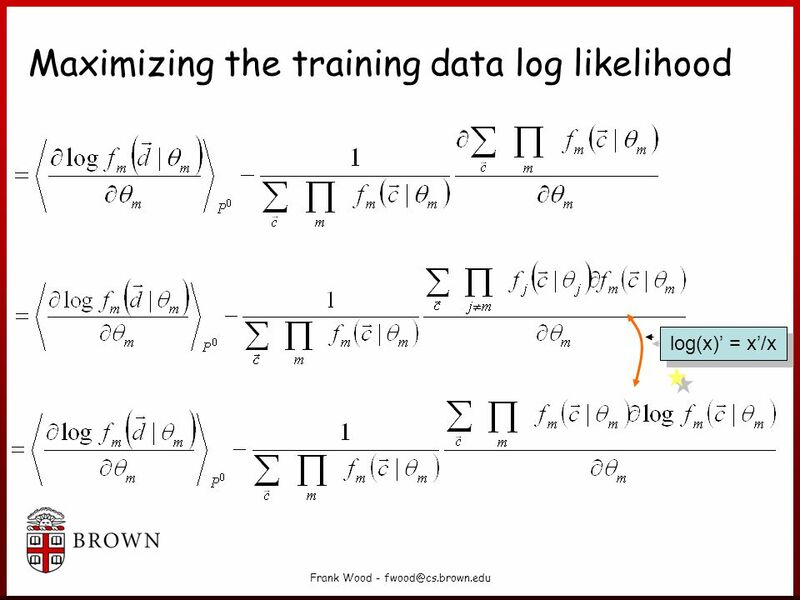 Recall: Key Components of Intelligent Agents Representation Language: Graph, Bayes Nets, Linear functions Inference. Random Number Generators Jake Blanchard Spring 2010 Uncertainty Analysis for Engineers1. EM Algorithm Jur van den Berg. Hidden Variables, the EM Algorithm, and Mixtures of Gaussians Computer Vision CS 543 / ECE 549 University of Illinois Derek Hoiem 03/15/12. GrabCut Interactive Image (and Stereo) Segmentation Joon Jae Lee Keimyung University Welcome. I will present Grabcut – an Interactive tool for foreground. Variational Inference for Dirichlet Process Mixture Daniel Klein and Soravit Beer Changpinyo October 11, 2011 Applied Bayesian Nonparametrics Special Topics. Optimization methods Morten Nielsen Department of Systems biology, DTU. Monte Carlo Simulation Methods - ideal gas. Calculating properties by integration. 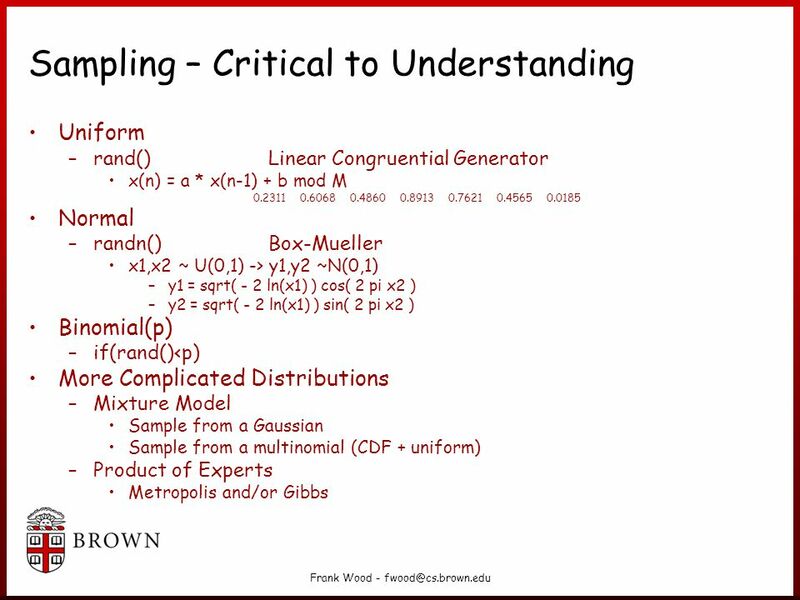 EE 290A: Generalized Principal Component Analysis Lecture 6: Iterative Methods for Mixture-Model Segmentation Sastry & Yang © Spring, 2011EE 290A, University.